We’re proud of the diverse line of genetics we have in our herd which include an array of winning combinations from the well known and much sought after: Jolimont Peruvian Virachocha, CPeruvian Aldo, Victor's Vaccoyo, NGG Lionel, Peruvian Bonanza, CPeruvian Daniel, Jolimont Peruvian Galileo, Peruvian Hemingway. The focus of our breeding program is the improvement of the fleece quality, however we will not sacrifice the quality and soundness of our alpacas along the way. Breeding stock is carefully chosen to bring out the best in both fleece characteristics, conformation and temperament. 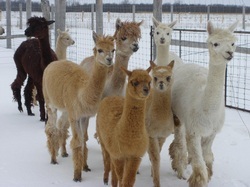 As a result of our objective to breed only the best, the majority of our alpacas are Canadian registered only. A dual registration definitely does not reflect the quality of the alpaca and we believe that unless the alpaca is being actively marketed to “the states” paying more for an ARI registered alpaca may do nothing but empty your bank account. Breeding and birthing occurs every year, again for fibre improvement, however to assist with herd size and health management, we may not breed every dam each year. To control our herd size, our objective is for our alpaca sales to closely match the number of annual births. This may mean that we can sometimes offer alpacas for sale at significantly reduced prices. This does not mean they are of lesser quality however, rather as in other businesses they are considered ‘over stock’. These same alpacas will appear as champions in the show ring or as herdsires on other farms. A definite win/win for everyone!